Cremation in no way prevents family and friends from participating in the traditions, ceremonies, or rituals of a funeral service. In fact, often times the only difference between a funeral celebration followed by a burial and one followed by cremation, is that the body is taken to the crematory after the services instead of the cemetery. We do not have a crematory here at the Cournoyer Funeral Home and Cremation Center. In 2000, we invested a great deal of time and effort into researching whether or not we should open our own crematorium. We decided against doing this mainly because of the relationship we have forged with our friends at the Concord Crematorium in Concord, New Hampshire. We have worked with the Concord Crematorium for over 45 years and continue to be impressed with their personal and individual care and attention to detail. If we were not comfortable, and if we were not able to convey this sense of confidence to the families we serve, we would have built our own crematory. Instead, we are able to concentrate all of our efforts where they are needed most, with our assistance to you and your family, no matter what type of service is selected. With over 60 years of experience in providing cremation services, we feel we can offer more guidance and suggestions on how to make any cremation service selected more personalized and more meaningful, than any other funeral provider. One of the greatest misunderstandings about cremation is that many people believe that choosing cremation means limiting your options. Actually, there are many more options available with cremation. Many people find that opting for cremation gives them more of an opportunity to be creative and personalize every aspect of the service for a more meaningful experience. With cremation, most families hold some form of service, whether it is public or private. A Funeral or Memorial Service can take place before or after the actual cremation process. When the service occurs before cremation, you may choose to have a visitation or a small gathering, which can be either public or private, with an open or closed casket. When the service follows cremation, an urn containing the cremated body may take a place of prominence instead of a casket. If a cemetery setting is not preferred after cremation takes place, there are several meaningful and creative ways to carry out the different wishes people have in regards to the cremated body. 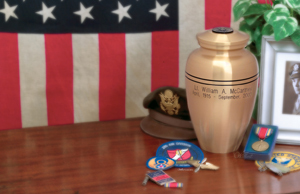 Family members may retain a portion of or all of the cremated body in various keepsake urns or cremation jewelry that is now available. 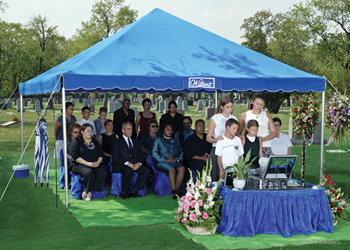 Scattering the cremated body is a popular option and it is allowed in most areas. We often make excursions with families who wish to have a ceremonial scattering of the cremated body. Scattering may be done in person, from a plane or a boat; even fireworks have been used to scatter a small portion. Creativity and imagination are the only limits to how many different ways this can be accomplished. Another alternative is that we can hold the cremated body for what is often many years while waiting for the surviving spouse to die so that they may be buried together, either in the same casket or urn, or in a companion urn. We believe in careful service and we maintain our steadfast dedication to time honored traditions and to preserving the dignity and respect of everyone we serve. When families choose cremation, and when conditions allow, we will use our Funeral Ark at the Memorial and Graveside Service. The Ark enables us to provide the greatest level of respect and care that everyone deserves. The Ark allows the involvement of pallbearers; which, alone, can give relatives or friends a feeling of being involved and provide them with an opportunity to perform one last act of kindness by helping in this manner. 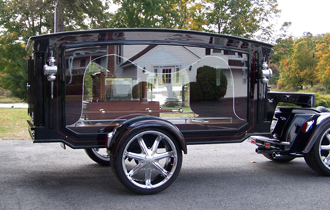 The Ark allows us to transport the urn in our hearse in the same respectful manner a casket is, meaning the urn does not simply sit on the floor or seat or in the trunk of a car. The Ark also provides an opportunity for everyone in attendance to proceed to the cemetery in a safe and organized funeral procession from our chapel or from a church. Please understand that we make no additional charges for the use of our Funeral Ark.